Vista Studio artist Michel McNinch is participating with the Corley Mill Artists’ Group in ART WITH A HEART, a charity benefiting the Ronald McDonald House on Friday, May 2 at 5:30. 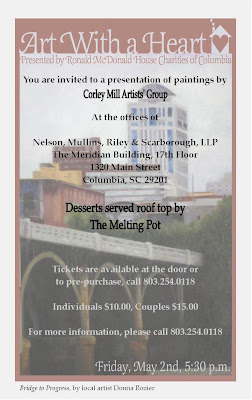 The event is being held at the offices of Nelson, Nullins, Riley & Scarborough, LLP in the Meridian Building, 17th floor, 1320 Main Street, Columbia, SC 29201. The Melting Pot is serving desserts on the rooftop. Tickets are only $10 for an individual and $15 for a couple. More information is available by calling (803) 254-0118.